Have you heard of Mad Friday? It's like the British version of a frat party run amok, except the people celebrating aren't all in college and the partying takes place in bars and on streets the Friday before Christmas. There's still plenty of alcohol, violence and incessant PDA though. 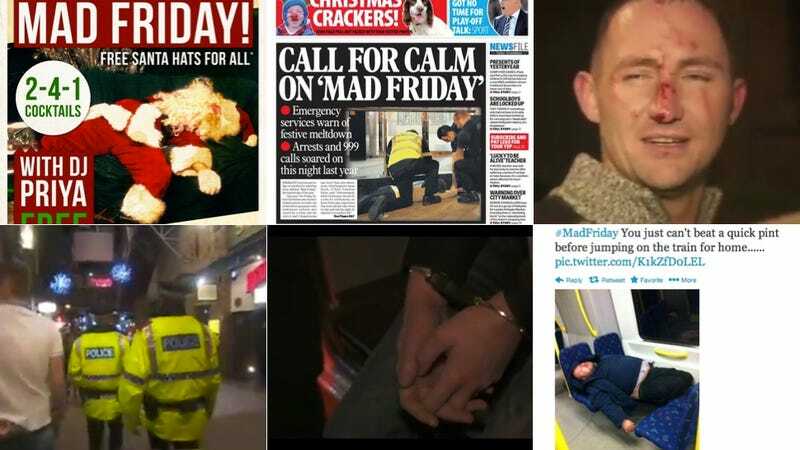 "A night to remember or a night to forget: welcome to Mad Friday," explains the BBC. Captions on photos of this year's Mad Friday at the Daily Mail include "Romance is in the air: A woman's skirt is pulled up to her waist as she shares a passionate kiss with another reveller in Cardiff" and "A reveller attends a man passed out on a street in Liverpool next to what appears to be a puddle of vomit." At the Metro another reads "No taxis? This woman tries lying down on a barrier in the hope it turns into a magic carpet," just one of numerous photos of intoxicated people laying in the streets in untraditional and downright uncomfortable locations. From Falstaff to Churchill and beyond, Britons have been known for their love of drink. But whether as entertainment or mating ritual, the spectacle of dressed-up youth wandering the early morning streets barely able to walk or talk has become an issue of growing social importance, because of both the violence that alcohol often engenders and the vulnerability of young women, who are sometimes molested or raped when they are in no condition to defend themselves. On Mad Friday, the number of police officers on duty apparently doubles in some towns. In order to convince people to drink less, West Yorkshire police department released a dramatic video with graphic photos demonstrating the sad end result of drinking and driving. Police in Yorkshire also tweeted out "details of incidents that are reported to them to help local residents understand the variety and quantity of calls that officers deal with at this time of year." One such example: "Just been to a very drunk man curled in a ball and reporting seeing aliens in Denby Dale....and so our #MadFriday begins. #WYtweetmas." So bottom line: even though some of these photos of people generally being idiots are very funny at first glance – though not quite SantaCon funny – in actuality, be safe kids (and adults).